Well, this was a given really, wasn't it? Who doesn't love a bit of Soap & Glory? I'm a big fan of all their bath and body products and my absolute favourite range from them is Sugar Crush - a beautiful sweet lime and sugar citrusy scent. My love of Sugar Crush began with their body scrub (which is another favourite) and I've been loving the body butter version over the past twelve months. This is the mini size I got last Christmas - I really need to treat myself to the big pot. Its moisturising, sinks in quickly and smells divine. What more could I want? So this is a bit of a random one as it isn't body 'care' so to speak, its more a product to make my skin look better for special occasions! I picked this up on a random trip to Superdrug before a big night out in the hope it would make my look glowing. After all, if I'm going to spend time highlighting my face, why not highlight my body too? I use this every time I go on a night out and apply it to my collar bones, arms and down the front of my legs. As well as being lightly moisturising, its adds the most beautiful golden sheen to my skin and looks super pretty when it catches the light. Its definitely not an essential product but for its cheap price tag, its one well worth trying out! Throughout the Summer months I like to keep my tan topped up with the help of a daily gradual tanner and my favourite one by an absolute mile would definitely be the Garnier Summer body moisturising lotion. I used this frequently in the summer of 2014 and it did a brilliant job at keeping my skin looking naturally sun kissed as well as supple and hydrated. I love that it can be applied daily and the colour it provides is actually very impressive - after a few days of use I look noticeably more tanned. This is definitely a Summer must have in my book! The false tan I've been turning to throughout the Winter months to stop me looking like Caspar the friendly ghost is the Sienna X Q10 bronzing mousse. I've mainly been using it before a night out and I find the mousse formula SO easy to apply - I'd go as far as saying its foolproof. It spreads onto the skin very evenly leaving no nasty streaks behind and it provides an instant natural colour. No orange in sight! I usually apply this once or twice before a night out, depending on how deep I want the colour. After one application it provides a medium sun kissed colour and after two applications it gives a deep bronzed look. I also love how this product smells which is unusual for a false tan - it smells lovely and fresh! I might do a full review on this soon with before and after images, if that would be of interest? In Summer, I'm all about the pale and pastel nail polishes. I'm a big fan of neutral shades too so when I discovered the Rimmel 'Lose Your Lingerie' polish by Rita Ora which is a beautiful pastel pink shade, it couldn't have been more perfect for me. It reminds me of the famous Essie 'Fiji' nail polish which we all know is one of those shades that looks perfect with a Summer tan. Well, this one from Rimmel does exactly the same, only for a cheaper price tag. It also has a lovely opaque formula, easy to use wide brush and its long lasting too! This Liz Earle polish in the shade 'Old Velvet' has been my go to Winter nail polish. Other than having the most beautiful opaque, streak-free and glossy formula, I just love the deep burgundy shade. When it comes to nails, my preferences tend to be pastels or deep vampy shades - I'm not too fond of bright neon colours (Models Own Hedonist is an exception to this) so I love it when A/W rolls around and I can bring out the deep reds, plums and greys. This one from Liz Earle isn't cheap at £8.50 but the price is reflected in the quality - I can't fault it. When Bourjois released this magic nail polish remover last year, I was super excited. I loved their original magic nail polish remover pot as it makes removing nail polish a total doodle but now they've catered for toes too, its even better. If you don't know how this works, its basically a pot with foam soaked in nail polish remover which you dip your finger in to remove your nail polish. It then has a small piece of foam attached to the lid which again is drenched in polish remover so you can rub it over your toes. Genius! I'm bloomin rubbish at explaining fragrances so don't expect any great detail here. However, this pair have been my most worn fragrances of the past year. I got the L'Occitane Cherry Blossom Eau de toilette as a birthday gift from my dad after falling in love with the Cherry Blossom hand cream (also a favourite, I just didn't have it at hand to photograph) and I wore it throughout the whole of Summer. Its sweet, light and feminine - everything I love in a scent. If you love all things Cherry like me, you must give this a sniff. As for the Hugo Boss Ma Vie perfume, this has been more my evening perfume of choice as I find it to be floral and feminine but also very sensual thanks to the woody notes. Its one of those fragrances that instantly makes you feel womanly, glam and ready to take on the world! I love Sugar Crush, it's my favourite Soap and Glory range. I tried the Garnier Summer Body Moisturising Lotion! It's amazing! Also the nail polish remover from Bourjois! I'm in love with these products! Love the sugar crush scent, soooo yummy! 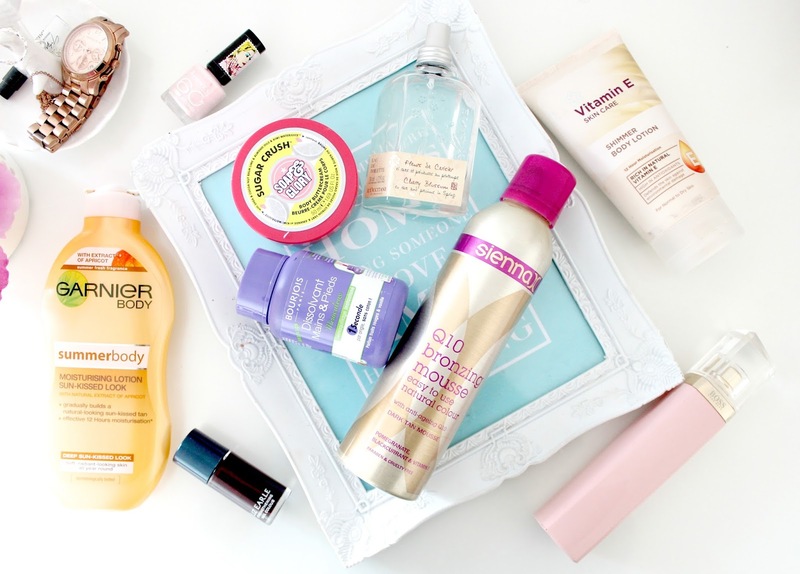 amazing picks, i love the garnier summer body moisturising lotion! 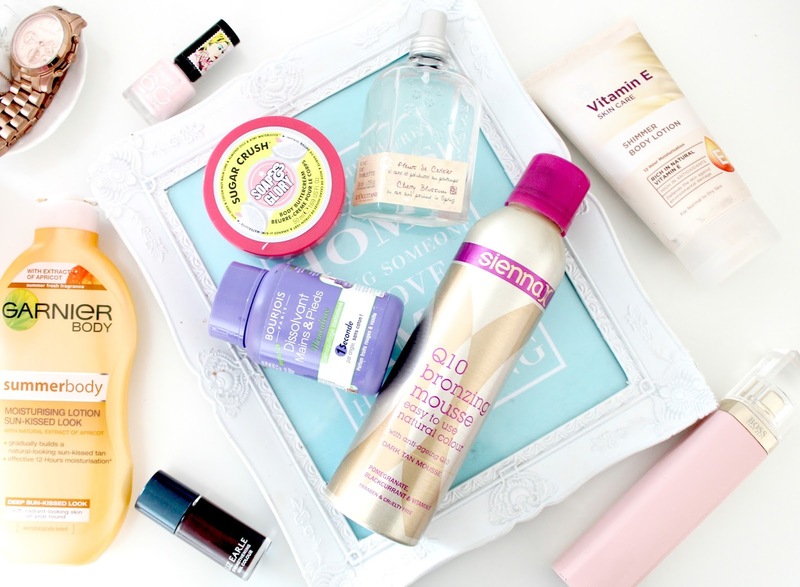 Love your favourites, especially the Soap & Glory Sugar Crush! I am interested to give the Vitamin E Shimmer Body Lotion a go, sounds fab ! I love the Superdrug vitamin E range as well, just the same as The Body Shops, but much more affordable! That simmer body lotion and tanning spray look amazing!! Ill have to give them a try! Your posts are always amazing and well written. Love your blog! Oh, the sugar crush range is much loved by many. I also featured it in my 2014 favourites. I'm so gonna try out the Garnier Bodylotion once I'm back from a holiday and want to still look tanned. These products all sound lovely! Need to try out some of them this year haha.